DES MOINES, IOWA (April 19, 2019) — Iowa’s seasonally-adjusted unemployment-rate remained at 2.4 percent in March. The state’s jobless rate was 2.7 percent one year ago. The US unemployment-rate remained at 3.8 percent in March. DES MOINES, IOWA (April 17, 2019) — On April 12, 2019, FEMA declared individuals in Pottawattamie and Shelby counties eligible for individual assistance. The FEMA-finding determined that these counties were adversely affected by the event declared a major disaster by the President in his Declaration of March 23, 2019. DES MOINES, IOWA (April 15, 2019) — Iowans will gather to pay tribute to those Iowans who lost their lives in 2018 while on the job at the annual Workers’ Memorial Day ceremony on Monday, April 29, at 11AM. The ceremony will be held at the State Capitol, West Terrace lawn. In case of inclement-weather, the ceremony will be held in the Wallace Building Auditorium 502 E 9th Street. in Des Moines. DES MOINES, IOWA (April 1, 2019) — As part of Iowa’s effort to strengthen or expand Registered Apprenticeship Programs within the health-care industry, three organizations were selected by Iowa Workforce Development to receive funding. They include: Broadlawns Medical Center; Kirkwood Community College; and the University of Iowa College of Nursing. DES MOINES, IOWA (March 26, 2019) — Iowans in Fremont, Harrison, Mills, Monona, and Woodbury counties have until April 25, 2019 to apply for Disaster Unemployment Assistance (DUA). DES MOINES, IOWA (March 22, 2019) — Iowa’s seasonally-adjusted unemployment rate remained at 2.4 percent in February. The state’s jobless rate was 2.7 percent one year ago. The US unemployment rate dropped to 3.8 percent in February. 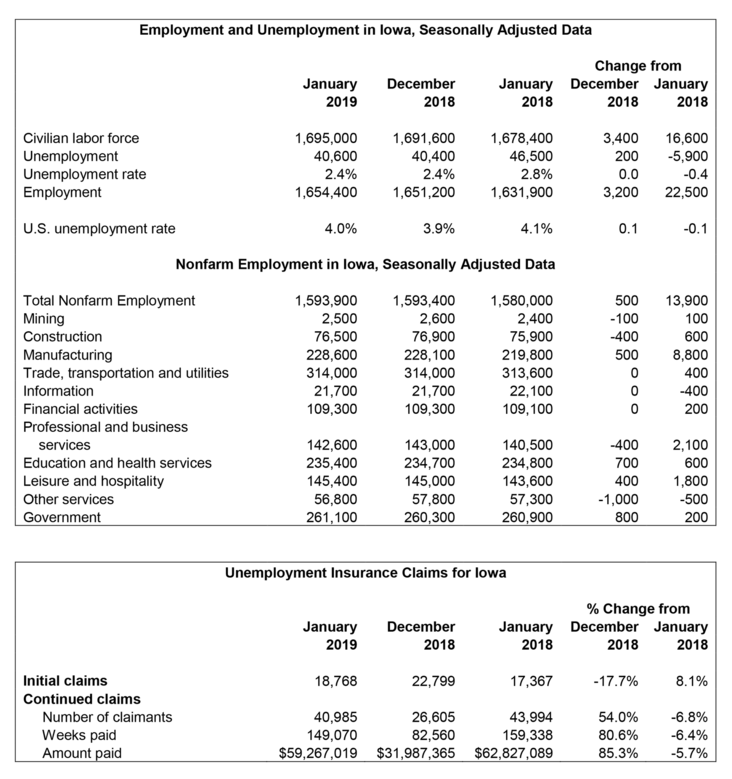 DES MOINES, IOWA (March 11, 2019) — Iowa’s seasonally adjusted unemployment rate remained at 2.4 percent in January. The state’s jobless rate was 2.8 percent one year ago. The US unemployment rate rose to 4.0 percent in January. DES MOINES, IOWA (February 22, 2019) — Iowa Division of Labor Commissioner Michael Mauro has announced his planned retirement for April 1. Commissioner Mauro was appointed by Governor Terry Branstad in April 2011, and has served Iowa in state and local government for more than 35 years. DES MOINES, IOWA (January 28, 2019) — Organizations have until 2PM on Friday, February 22, to submit proposals to Iowa Workforce Development to receive funding to grow Registered Apprenticeship opportunities in Iowa.